2018 Fifa World Cup Complete Match Schedule in Indian Standard Time (IST) is announced. This is the 21st edition of FIFA World Cup, which will be hosted in Russia. All the matches are schedule from 14th June to 15th July 2018. This is biggest soccer carnival in world contesting in every fourth year. Thirty Two national teams, selected from members of associations of FIFA will be participated in 2018 FIFA World Cup, through the eight groups. There are total of 64 matches in 2018 FIFA World Cup hosting in Russia. 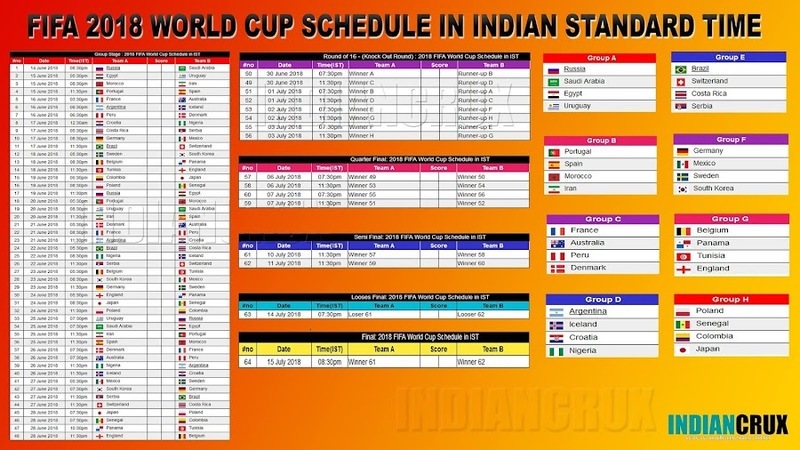 After the success of our previous post, FIFA 2014 World Cup Schedule in Indian Standard Time, Indiancrux.info created a useful schedule, Match calendar of FIFA 2018 World Cup in Indian Standard Time. Stay tuned with us for the downloadable JPG, PDF formatted World Cup Schedules. We found that so many peoples from India were searing in internet for "World Cup Schedule Indian time", "FIFA 2018 in IST", "Fifa 2018 Schedule in Indian Time", "2018 World Cup Schedule in Indian Time", "2018 World Cup Schedule in PDF Format","Downloadable PDF Schedule of FIFA 2018","FIFA schedule in Indian Time","2018 World cup fixture in Indian Time", "2018 FIFA World Cup Schedule Excel File", "2018 World Cup Schedule in Excel Format" and etc. Because of these huge search query from India, Indiancrux.info started writing all sports schedule in Indian Standard Times, since 2014 FIFA World Cup. Two teams, who score more points from each group will advance to second round. Here is the complete match schedule of First round of 2018 FIFA World Cup in Indian Standard Time (IST). The fantastic groups of the world cup 2018.which team will win the world cup.I support Argentina for Messi.The game is not so late ,Let the game begins. at final match WINNER - 61 VS WINNER - 63 ! Actually match 63 is looser's final that is play off match. Final matches will be played between the winners of Two Semi Finals. Spot on, Messi deserves the winning title under his belt to become one the greatest of all time! Thank you for your valuable suggestions ! is there something wrong with match no 49 and 50 and there timings? Mine view is that match no 49 should have 7.30pm and no 50 should have 11.30 pm. According to FIFA, Match numbers are not in order with match timing. See FIFA Official site or Wikipedia, You can see the match no 50 (Group C Winner vs Group D Runner-Up) is coming before match no 49. German vs Brazil in final as per schedules and not able to comment on winner. On 15th July 2018, We will see the World's No:1 Soccer Team and get answer to the question Who will be the Soccer King ?. 2018 FIFA World Cup Match Schedule in Indian Time is here and You can download this Excel file to see the match schedule in Your own time zone. Change the timezone in FIFA 2018 Excel Schedule to see the math timing in your local time. No need password for any protected excel sheet ! only required some VBA Codes !! ITALY DID NOT ENTERED IN QUALIFYING ROUND? It is so sad, Four Time champions Italy didn't qualified this time. For the first time in world cup history since 1958.
spain vs brazil in finals !! Four times champion ITALY missing. Dear Abdul Basheer, could you share me 2018 Schedule with IST time. Can you pls share me 2018 schedule in IST time. Am not able to download the fixtures. Not quite closely in touch with the teams & players though, my gut feeling France could be a potential contender for championship. I'm also looking forward how Belgium fares this time. Thank you for your Awesome words !. And i support your attitude towards the sports. Sorry, who is RSA, South Africa ? Well, am with Colombia & Mexico...!! !